Save up to $20 when you book online! Spring is the busiest season of the year for golf on the Grand Strand. Golfers from all over dust off their clubs from the long winter hiatus, and bring them to the North and South Carolina coast to play some of the best golf courses in the world. There are some major benefits to playing golf here in the Spring as well as some things to watch out for. The Weather: Our weather from the middle of February through the middle of May along the Grand Strand is fabulous. High temperatures will typically range from the mid 60s in February to the low 80s in May. Course Conditions: During the Spring the golf courses are in their prime condition! With limited play during the winter months the courses have time to heal and look great come Spring time. The blooming of Spring flowers and trees really add to the beauty of the courses, and if you are lucky enough to play when the Azaleas are in bloom, you are really in for a treat. 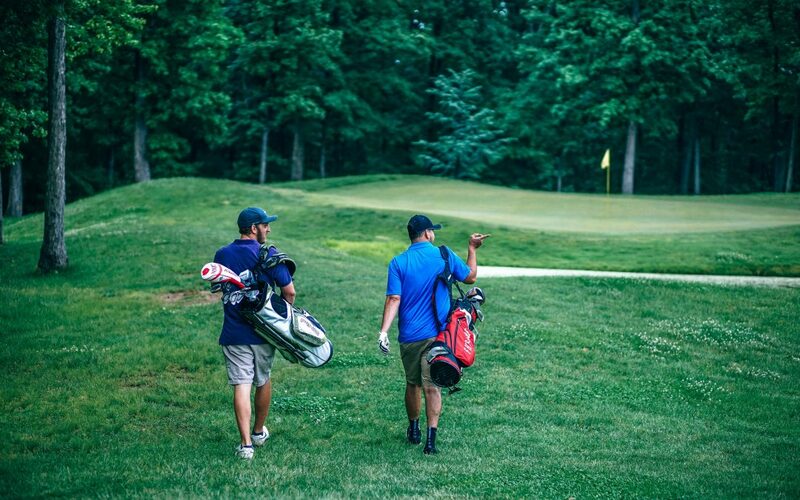 Time for 36: If you are a golf fanatic and love to play 36 a day, just be sure to book your Spring golf after daylight savings begins in early March. With the amount of courses in the area it is great to double dip and get 36 in a day. The Pearl is a perfect place to plan to play 36 with two 18 hole facilities on the same property. Beaches Are Less Crowded: Once you get your fill of golf, the Spring is a great time to visit a beach along the Grand Strand. The weather is usually plenty warm and the beaches are way less crowded than in the Summer. Restaurants Are Less Crowded. Even with all the golfers in town, the restaurants are still less crowded (and less young children) than in the peak of tourist season in the Summer. You will be able to get into most restaurants without a wait and get much better service than in the Summer. Tough To Get a Tee Time: Being the busiest time of the year for golf, tee times can be a bit more difficult to come by. I would certainly recommend planning ahead and booking your tee times in advance to be sure you can get the times you want, at the course you want. Slower Pace Of Play: Just like a busy highway, the more golfers on the course, the slower the pace will be. I am not saying you should expect a 6 hour round, but you will not likely be able to fly around in 3 hours like you can do at some other times of the year. Golf courses will have marshals monitoring the pace and trying to alleviate any bottlenecks but a 4.5 hour round is the norm this time of year. Price: The deals on golf along the Grand Strand are second to none, but it is true during the Spring golf season the prices are the higher than at any other point during the year. This is just a simple matter of supply and demand. Allergies: One of the pros about Spring golf, are the flowers coming into bloom, it can also be a con for someone with allergies. There is usually a ton of pollen floating around in the air and if you suffer from allergies, be sure to bring whatever medicine helps you get through it. Bugs: The Spring is when the annoying little bloodsucking creatures come out in abundance. If you are playing an early morning round or finishing up your second round later in the evening, be sure to have bug spray with you.